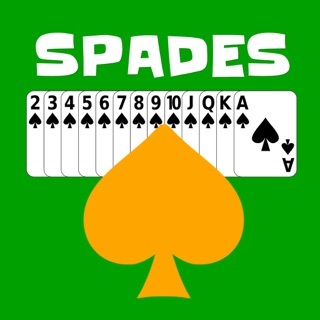 Spades is a trick-taking card game that can be played with 3 players solo, 4 players solo, or 4 players with partners (2 teams of 2). 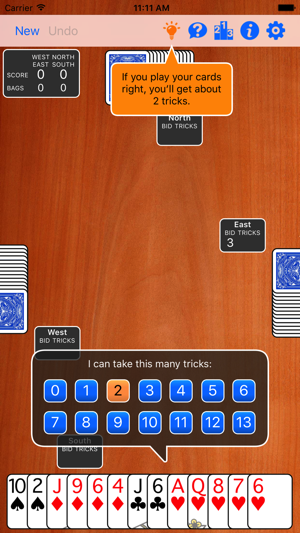 A standard 52-card deck is dealt, then players bid the number of tricks they can take. The goal is to take as many tricks as were bid. 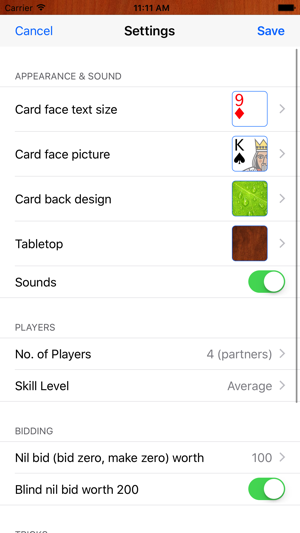 When playing with partners, North/South is one team, West/East is the other, and teammates' bids and tricks are combined, so one player's underbid can compensate for his teammate's overbid. 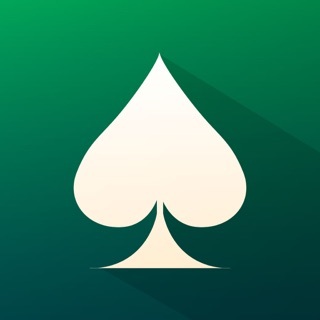 This app allows you to configure number of players and teams, the appearance of the table and cards, rules about nil bids and when spades can be lead. There are instructions included in the app, as well as a setting to make your robot opponents less aggressive or more aggressive. Fixes sporadic bug that prevented closing settings. This is a great game but for one thing. When the opponents bid "O" my partner doesn’t adjust his strategy to compete with them. He leads in every case, with his highest card instead of a low card to force the "O" bidder to throw high. The other team will try to trip me up if their bid will allow it. 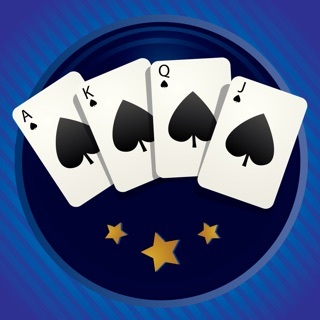 This is the best Spades game there is. 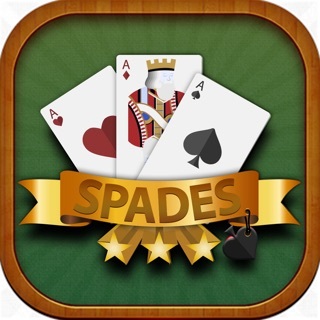 Why does your other Spades game charge $1.99 to download? Can you fix my "North" partner? I love playing this game except when I want to crack my partner over the head! Heh, heh violent grandmother! Good game, easy to view. 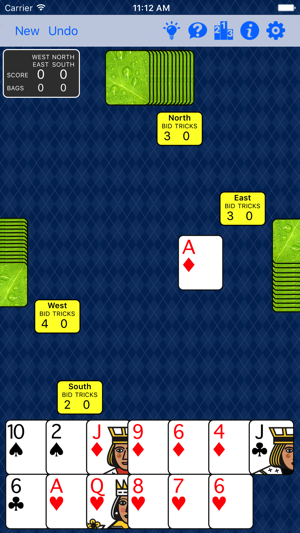 You can learn/cheat yourself with the undo and also look at the other hands cards. These learning/cheat tools actually helps you understand how to play better. Also if you touch the wrong card you can undo. That’s what I like. 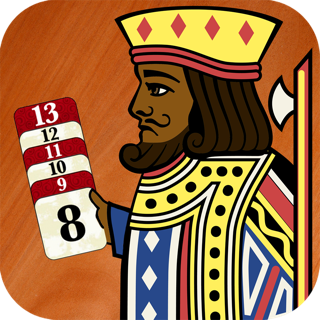 No frustration playing this game, just fun! The rundown on stats could be better, but it is a free game!!! The South facing player often undercuts its North partner, especially when North bids double nil.. Not quite intuitive enough. It’s as if South is not fully aware of the bids made by North. 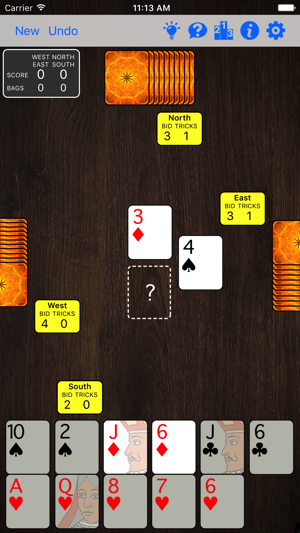 Also, North plays the first trick first in every hand. Once in a while West will play first, but that’s not consistent. 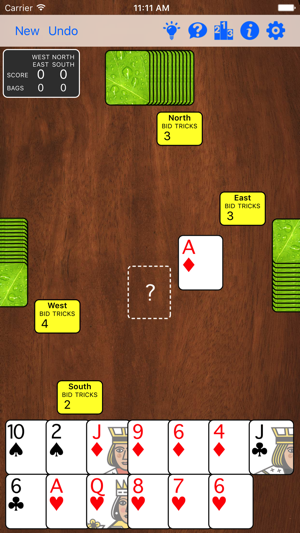 Usually the player to the left of the dealer leads the first trick. This doesn’t happen at all. Otherwise, the best of all similar games. © 2011-2019 fishdog.net, LLC. All rights reserved.